Victorian tiles are a type of encaustic tile that are most notably known for their striking geometric patterns. They are often used for restorations and historical replicas, but many interested buyers are also using Victorian tiles for new buildings and modern style homes. They are both striking and bold as well as intricate and busy, and make for great features to add interest and pattern in more contemporary homes, and complement the historical styles of traditional homes alike. Encaustic tiles were widely used in the 12th century by monks for their places of worship. Henry VIII closed down many monasteries in the 16th century and greatly diminished the encaustic tile industry for nearly 400 years. At the beginning of the 19th century, encaustic tiles saw a revival and ceramic tile manufacturers emerged and made this material a popular trend for not just religious establishments but also private residences and commercial buildings. The early 19thcentury through the turn of the 20th century is known as the Victorian period and Edwardian Era, which is why this type and style of tile is referred to as Victorian tiles. They are essentially British floor tiles, and have been used in many halls, conservatories, kitchens, bathrooms, and patios and walkways. What Are Traditional Victorian Tile Designs? Many original Victorian tiles were a black and white colored pattern, often in a checkerboard design. Victorian tiles are well known for their geometric floor tiles, usually featuring square, rectangle, diamond, and octagon shapes. Another classic Victorian tile was the mosaic floor tile, which boasted a wide array of rich colors and intricate patterns, like Fleur-de-lis type scrolls, flowers, birds, and literature characters. In addition to the classic black and white scheme, many Victorian tiles were designed in a Harlequin style, using royal colors like blue, burgundy, and white. How do Victorian Tiles Differ from Other Tile Types? Victorian tiles have been called many other names, including Cuban tiles, Hydraulic tiles, Encaustic tiles, and Cement tiles. The true Victorian tiles are ceramic tiles made with clays and powdered glazes and fired in a kiln. However, for many people, Victorian tiles are more about the beautiful geometric patterns than the materials they are made from. Cement tiles are made with a mixture of cement, color pigments, sand, and marble powder that is poured into molds. The result is a unique and beautiful tile with amazing geometric designs that is highly durable and won’t show signs of wear as quickly as the original Victorian ceramic tiles. Where Are Victorian Tiles Used? Victorian tiles are most famous for the exquisitely tiled floors seen throughout Europe and the United States, but they have also been used to create decorative wall features, fireplace mantels, and patios and outdoor pathways. Victorian tiles turned otherwise plain floors and walls into interesting works of art, and have always been very hard-wearing. Victorian tiles have been used since they were first popular in the early 19th century for creating ornamental floor medallions, courtyards, and tiled rugs and runners. They can separate spaces and give the illusion of multiple types of flooring. Aristocratic homes often had special tiles designed with a family crest or symbol and incorporated them into the floor or wall design. 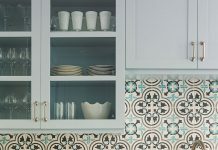 Victorian-like cement tiles are also popular for bathroom floors and walls, showers, creating the look of wainscoting or crown molding, and for kitchen floors and backsplashes. They are hardy enough to withstand high traffic areas and won’t fade or chip easily due to the intense manufacturing process. Where Can I Buy Victorian-Like Tiles? Victorian-like tiles can be found where cement tiles are manufactured. 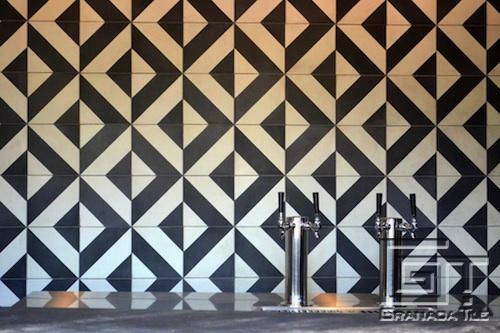 Granada Tiles carries many styles and patterns of cement tiles, offering those who want the traditional geometric styles of classic Victorian tiles the opportunity to personalize their own from the wide array of shapes and colors available. Victorian tiles were traditionally laid in interlocking designs by grouping four tiles together and rotating each tile by 90 degrees to create a quadrant. Any number of tile shapes, like rectangle or diamond, can create this design, along with one, two, or multiple colors. 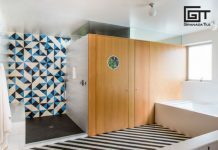 Homeowners can also create their own custom tile design if they don’t see a shape, pattern, or color they like on the website. If there’s a specific hue you would like, or you would like to incorporate your own feature tile, family crest, or other emblem, you can work with the designers at Granada Tile to create a design that includes your custom tiles and evokes the traditional Victorian tile. If you’re ready to design your own Victorian inspired tile, get in touch with the sales team at Granada Tile today, at sales@granadatile.com.